Do you remember your first hunt? Of course you do. Most of us can probably remember the breeze we felt, the smells, the sounds, and our exact surroundings that day. I know I can. It’s one of those memories that no matter how old I get and how much time passes, will stay with me forever. My dad woke me up early. It was the first day of rifle season in Pennsylvania. It was a typical November day in PA with grey, overcast skies, a steady breeze, and…finger numbing temperatures. Now I’d like to say the story ended with an incredible hunt and the taking of a nice buck, but that would be a lie. The truth is, I was so cold and so tired that I eventually found a piece of soft ground, laid down, and fell asleep. I don’t even know if there was a sighting of a deer that day. Nevertheless, that day was memorable because it was the day my dad began to pass down the heritage of hunting to me. During my teenage years, my dad continued to teach me how to hunt, but more importantly he taught me how to hunt ethically and safely. I can honestly say my ethical approach to hunting and harvesting game is all due to my dad’s teaching and I’m grateful for the time we’ve spent hunting together. I’ve recently done a bit of reading on the importance of passing our hunting heritage to the next generation of hunters. Passing down this heritage to a son or daughter, nephew or niece, or to a younger sibling is likely the most important obligation we have as hunters. As Father’s Day is nearly here, I’ve been reflecting more and more on my first hunting memory and my obligation to pass this hunting heritage along. My own daughter has shown an increased interest in hunting over the past year. At seven, she is already learning to shoot a compound bow and began practicing her gun skills earlier in the year with her pap’s .22. She enjoys going to the farm and helping put out mineral stations, but really she just loves the outdoors. 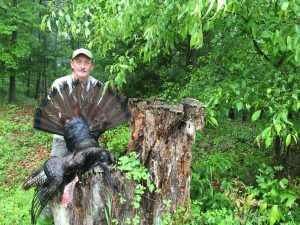 For months she had been pestering me to take her hunting, so I promised her a spring turkey hunt. Turkey season arrived and the weather was pretty awful just about every day. Cold and rain don’t exactly make for an ideal first hunting experience. Memorial Day weekend was the last Saturday of the season and the weather was finally looking good. I intended to keep my promise to my daughter, so I packed up the family and we headed to the farm. I’m pretty sure I was more excited for this first hunt than my daughter. Four-thirty on Saturday morning came quickly, and it took a little more coaxing than normal to get her out of bed. But once she was awake, she was ready to go. We packed up our gear and headed to the blind along the edge of a small field on the northwest part of the farm. My buddy Tate joined us and headed off to the ridge to our south. Once we got to the blind, we set up our decoys and settled in. The first part of the morning was extremely quiet. There was no wind to speak of and a really thick fog had settled over the field after the night’s rain. About twenty minutes in, I heard the first gobble. My daughter had never heard a turkey gobble before and totally missed it while she was digging through her bag for a snack. I waited a few minutes and told her to listen while I gave a call with my slate call. Two gobblers immediately responded. A look of astonishment crept across her face. I then gave her a turn with the call. She actually got a few responses, likely shock gobbles, but she didn’t care and neither did I. We called some more with a few response, but as the fog lifted, I could hear both birds moving away from us. At this point, we had been in the blind for nearly 3 hours and I could tell my daughter was getting tired and the snacks were gone too. I could’ve sat longer, but it was important to let my daughter dictate the hunt and make sure she had a good experience, so we began to pack up our bags. Just about that time, I heard Tate shoot and soon after received the confirmation text of a bird down. We finished packing up our gear and walked back to the car to go check out his harvest. Tate is a great hunting buddy, friend, and might be an even better story teller. Tate explained how the hunt came together, and my daughter was glued to his every word. She’s an avid reader and loves a good story, and this one did not disappoint. On our walk back to the car, we talked about Tate’s hunting story. I explained that sharing hunting stories is how hunters share experiences, knowledge, and grow a bond with each other. In some ways, the stories are even more important than hunting. She seemed to like the idea of story time at the end of each hunt. I don’t know if my daughter will want to continue hunting as she gets older, but my hope is she will. For now, we have a squirrel hunting date set for the fall and a youth turkey hunt planned for next spring, which is good enough for me. Whether she continues hunting or not, all I really want is for her to remember this day as fondly as I will. Truthfully, when I was a kid, I didn’t think much about the day my dad first took me hunting, but my dad understood its importance. And the impact of that one hunt is clearly felt and remembered even today. I can only hope that it is the same for my own child, as the hunter’s heritage is passed on, from father…to son… to daughter.